12 Goody Bags. 12 Goody Bags 12 Cupcake Toppers. 12 Cupcake Toppers made to match the cupcake toppers. 12 stickers. 12 Stickers I take great pride in making a quality product. 12 LOL Surprise Dolls w/ Matching Biggie Pets Cupcake Toppers. MORE LOL Surprise Cupcake Toppers Characters available. I also have. 12LOL Surprise Dolls & Lil Sisters Cupcake Toppers. MORE LOL Surprise Cupcake Toppers Characters available. I also have. Cupcake Toppers! Sleeping Beauty Silhouette. Set of 12 cupcake toppers. Matching banner and confetti are available. 12x edible wafer cupcake toppers. Made from wafer paper and high quality edible ink. Best regards. if anything happens and makes you feel unsatisfied. We ensure you that we will do what we can to solve the problem. BETTY BOOP CUPCAKE TOPPERS - SET OF 12. Set of 12 cupcake toppers. Matching banner and confetti are available. ALL CHARACTERS OR TEAMS IN THE NFL, MLB, NBA, NCAA ARE AVAILABLE. • They are made from the best quality icing and sugar craft materials, and are 100% edible. The colors may vary slightly in shade. Set of 12 cupcake toppers. Mini Cupcake Toppers are attached to a toothpick. Attached to a white lollypop stick. Make your party colorful with these very cute cupcake toppers. CUPCAKE TOPPERS. This Cupcake Toppers are perfect for a Special Party celebration. Hola esta venta es de Cupcake Topper ya estan listos para que los puedas usar para tu evento. Custom cupcake toppers printed in quality heavy yardstick. singled sided. wood stick. Response is usually quick. Custom cupcake toppers printed in quality heavy yardstick. singled sided. Response is usually quick. These can be used as party favors or cupcake toppers. They will be personalized, leave details at check-out. Pretty Unicorn- set. 24 Cupcake toppers. On a food grade lollipop stick. " 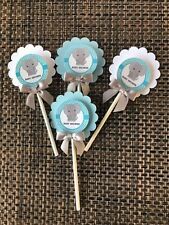 So there will not be any more misunderstandings, all cupcake picks will now be on the white lollipop sticks. Again this only applies to the cupcake picks". 24 Cupcake toppers. On a food grade lollipop stick. " 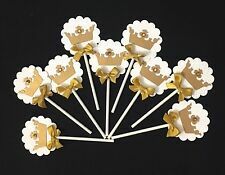 So there will not be any more misunderstandings, all cupcake picks will now be on the white lollipop sticks. Again this only applies to the cupcake picks". Make your Minnie party special with these 12 pieces Baby Minnie cupcake toppers. 24 Total Cupcake Toppers. The character sticker images are on one side only and the images pop out to give a 3D effect. The pictures may look blurry but they are clean and sharp looking. These are handmade and t he character images are free. Single Sided. All toppers are handcrafted. Laminated For Easy Clean Up. Set of 24 dinosaur cupcake toppers by Kate and Jake. You will get 6 pieces of each of the 4 designs as pictured. These are double sided and already assembled with the pick. Kate and Jake Dinosaur cupcake toppers. Little Buckaroo cupcake toppers. They would be great for a baby shower or a birthday. All items are printed, cut, glued and assembled ready for you to decorate your cupcakes! 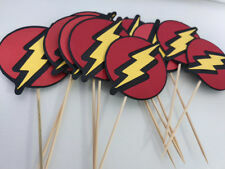 You will receive ~ 12 Cupcake toppers Toppers one sided, made from high quality cardstock, glued to a wooden toothpick. They measure approximately 3” I ship with 2 business days. Please message me if you need by a certain date so I can make sure you receive them in time. If you would like a custom order, just message me and I will do my best to accommodate you. Cupcake Toppers Little Buckaroo Cowboy. Condition is New. Shipped with USPS First Class Package. ★ HANDMADE UNICORN HEADBAND: these are high quality headbands with shiny golden unicorn horn wrapped with golden rope and they are ONE SIZE FITS ALL. ★ MULTI-PURPOSE, REUSABLE & EASY SET UP: Within MINUTES your party will be sparkling and shining. Gold glitter unicorn cupcake toppers are handmade in a smoke free crafting studio. You will receive 12 cupcake toppers. Wild kratts cupcake toppers cake decoration party favors...SET OF 20 Condition is New. Shipped with USPS First Class Package. 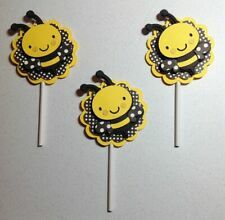 These adorable Cupcake Toppers will be perfect for your little ones birthday party or Baby Shower. 16 Cupcake Toppers measuring 3” Toppers are one sided, made from high quality cardstock, glued to a wooden toothpick. The color is more of a peachy coral. All items are printed, cut, glued and assembled ready for you to decorate your cupcakes! I ship with 2 business days. Please message me if you need by a certain date so I can make sure you receive them in time. If you would like a custom order, just message me and I will do my best to accommodate you. Cupcake Toppers. Condition is New. Shipped with USPS First Class Package. This floral unicorns gold glitter cupcakes topper perfect additions to decorate your party. The width of the topper approx 2". I try my best to make it as close as possible. The rights of image or credited to its rightful owner.